Oh gosh, my resolution was to write, write, write. And well, I've been cleaning out like I am moving or something! I love sending all this stuff off to another life. I am also on a mission to clean out the freezers, there's plenty of odds and ends that need to go away forever or get cooked! Last summer, my daughter went to visit her "special friend". Okay, fine, her boyfriend. So his family lives in Mississippi and someone has some property in the country, and Christina brought home bags of fresh picked produce. Fresh garlic, squash, zucchini, amazing blueberries, so much stuff! The squash was abundant, so I cut it up and froze it, thinking I would come up with something! Fast forward to December, and I am teaching a class at Whole Foods. 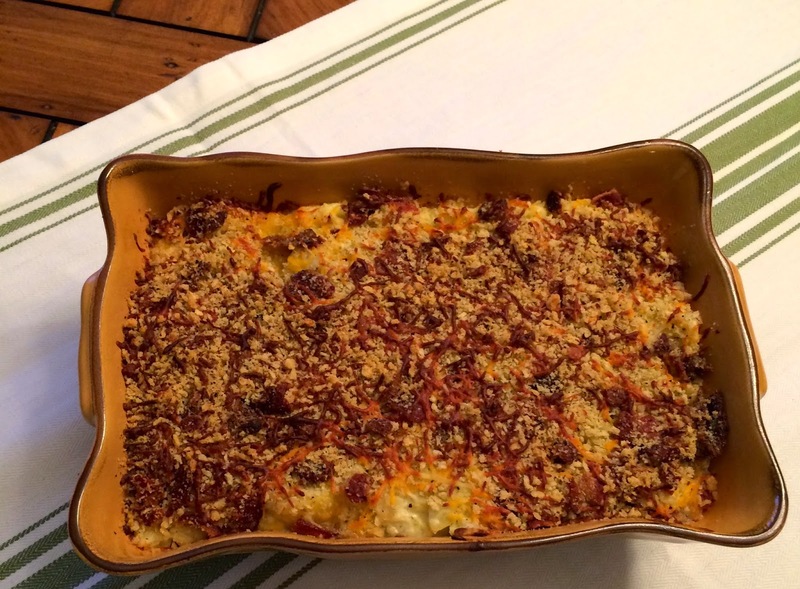 The director of these classes is an old coworker from Williams Sonoma, Bri Rogers, and in the holiday section of a local magazine she shared her family recipe for squash casserole. The magazine is called 4Memphis, and I would link to it but at the time of this writing, there is no way to get connected to their website. Not sure why. So here we go. Of course I have a few changes, which I noted, but I am excited to make this! One thing, I froze my squash without parboiling, and the skins are a little tough. It's not terrible, but I suspect a parboil before freezing may have helped this. But it doesn't matter, it's topped with cheese and bacon and panko. It's like the trinity of goodness! Butter a 3 qt casserole (I used a 6x11) Set aside. Preheat oven to 350º. In a large pot combine squash and onion and cover with water. Season with salt and bring to a boil. 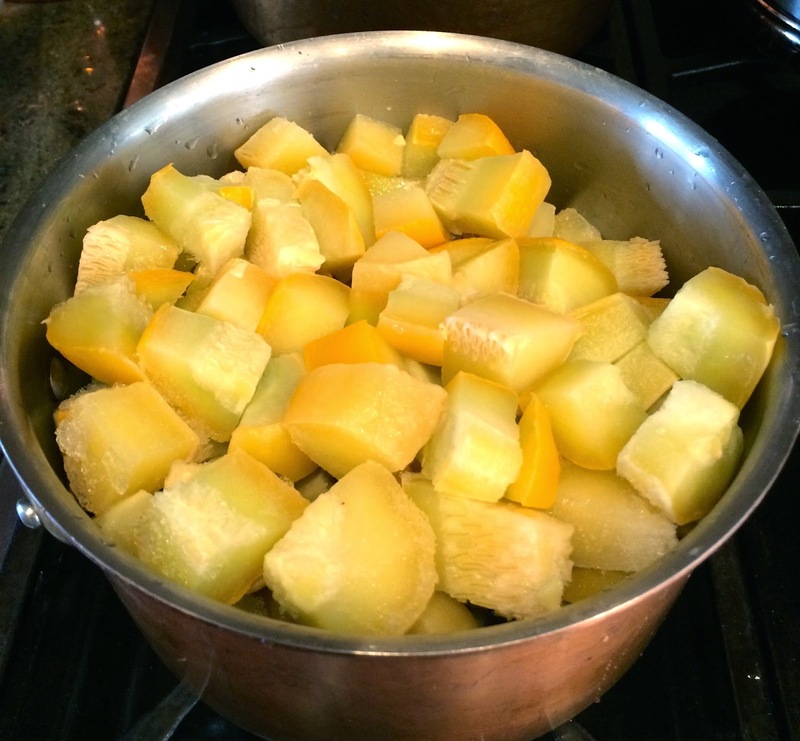 When squash is tender, about 15 minutes, drain and mash with a potato masher. I don't have a potato masher...I know, 17 years at Williams Sonoma and I do not own one! Drain again if its watery. Meanwhile pulse breadcrumbs in processor until fine and toss with bacon crumbles and cheese. (Skip the pulsing if you use Panko) Add butter and and sour cream to squash and mix well. Season with salt and pepper. Stir in eggs until incorporated and pour into prepared dish. 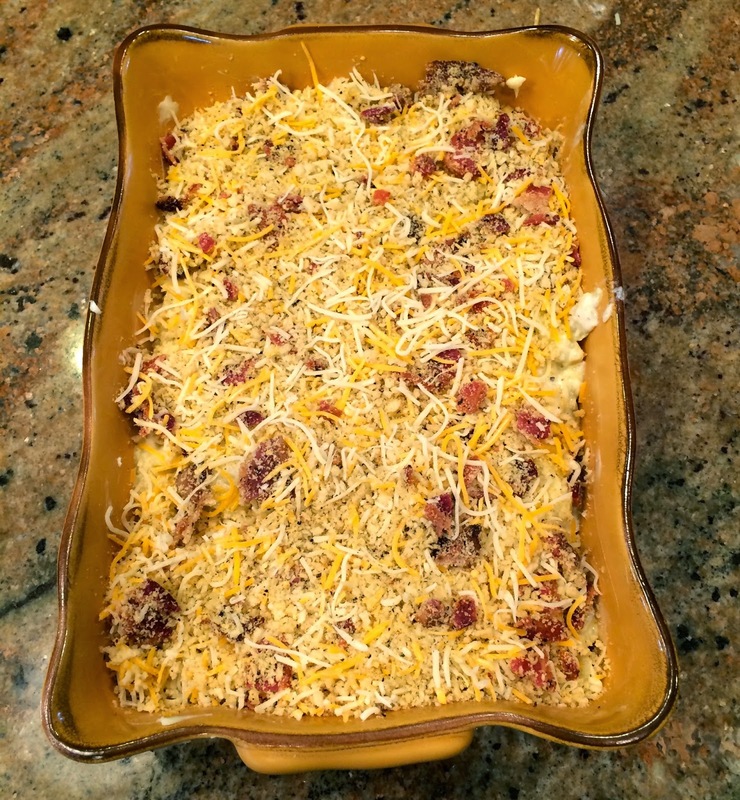 Top with breadcrumb/bacon/cheese mixture and bake for 25-30 minutes. Serve immediately. I give it 2 thumbs up! Delicious stuff...that crusty top is really good! The panko I used was Italian seasoned, and I thought it gave it a little umph. I think this would lend itself well to the addition of maybe a little garlic and some herbs. So, what are you waiting for? Get in there and cook! !